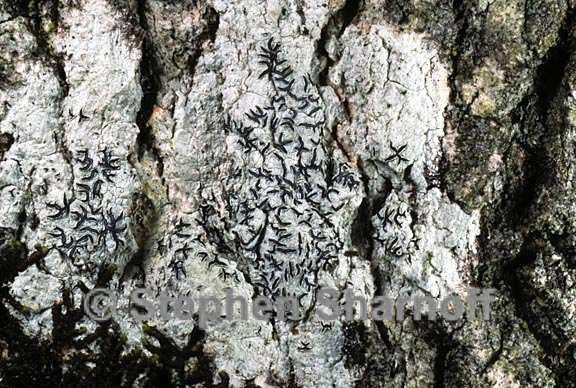 Thallus: crustose, continuous to slightly rugose surface: cream-colored, white or pale gray or grayish green, dull Apothecia: raised from the thallus, lirellate lirellae: oblong, ±flexuous and branched, 1-3 x 0.2-0.4 mm disc: narrow to wide and open, dark gray to brown with whitish pruina margin: well developed, covering the lateral part of the ascocarps; excipular lips: black, entire, sometimes narrow exciple: poorly developed and not carbonized at the base, carbonized laterally, with entire excipular lips whose basal part is sometimes less developed and less carbonized epihymenium: brown, 5-10 µm thick hymenium: not inspersed, 90-100 µm tall; paraphyses: 1.5-2 µm thick, dense, tips distinctly brown or yellowish brown; subhymenium: hyaline, 10-20 µm thick asci: clavate, 80-90 x 15-20 µm, 8-spored ascospores: hyaline, transversely 7-10-septate, somes spores terminally with one transverse septum, 25-45 x 7-9 µm, I+ blue-violet Pycnidia: immersed conidia: bacilliform, 2-5 x 1 µm (Purvis et al. 1992) Spot tests: cortex and medulla K-, C-, KC-, P- Secondary metabolites: none detected. Substrate and ecology: on smooth bark of deciduous trees, in humid, submontane or montane forests World distribution: depending on the species concept (see note) world-wide (including tropical regions) or restricted to temperate regions Sonoran distribution: Sierra Madre Occidental region of Chihuahua. Notes: The species concept for Graphis scripta is still not resolved and, depending on the view of an author, includes or excludes the tropical specimens. Staiger (2002) identified the tropical samples as Graphis furcata Fée and restricted Graphis scripta to collections from holarctic or southern temperate regions. We follow that concept here, as additional minor morphological differences (e.g. ±open discs in G. scripta versus closed, slit-like discs in G. furcata) can be observed. However, more morphological and molecular data are necessary to assess the validity of this point of view.